The Seaward Primetest 250 and the Megger PAT150 PAT testers are both small, battery powered, and and carry out the same basic tests as required by the IET Code of Practice. They are also both similarly priced. At current online prices (March 2016) the Primetest 250 is around £349+VAT and the PAT150 £399+VAT. Both testers can carry out a 200mA earth continuity test, 500V or 250V insulation test, substitute leakage test, and lead polarity test. 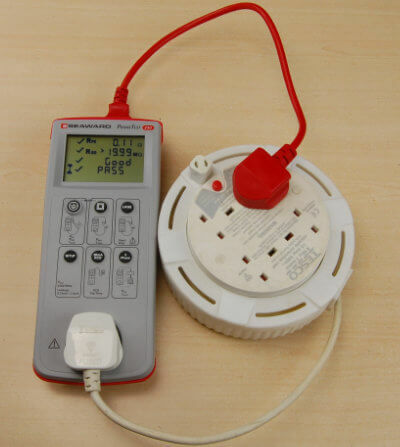 When plugged into the mains supply, both testers can also carry out a full earth leakage or touch current test, as well as an RCD test. The PAT150 is slightly larger and a bit heavier than Primetest 250 but there’s not much difference between them. The PAT150 definitely feels the more robust of the two, with a thick rubberised bumper covering the back on sides. The screen and keyboard are also protected by a clever flip over lid when not in use. 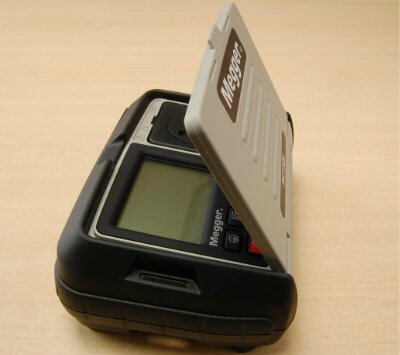 The Megger tester certainly gives the impression that it is built to withstand a few bumps and knocks. The Primetest is supplied with an additional soft carry case and also has some rubberised protection on the top and bottom edges, but just doesn’t feel quite as rugged as the Megger. Both testers have single button operation to initiate an automatic test routine for both Class 1 earthed equipment and Class 2 double insulated equipment. 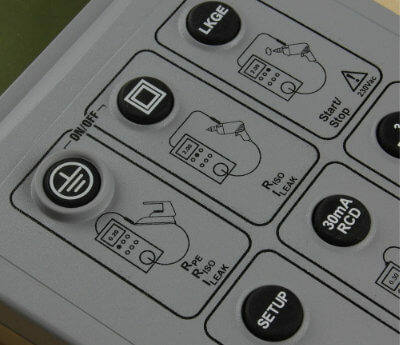 The PAT150 also has a separate button for the Extension/IEC lead test, whereas the Primetest 250 uses the same Class 1 button and automatically detects if an extension or IEC lead is connected. The buttons on the PAT150 have a nice positive feel. The buttons on the Primetest are rubber and can at times feel spongy and unresponsive. What I particularly like about the PAT150 is how the power button can be used at abort a test and return back to the main screen. This simple feature is surprisingly useful. The Primetest has no way to stop or abort a test sequence once it has been started. The available test options is one area where there are some big differences between the two. Both testers have the option to change the insulation resistance test voltage from 500V to 250V for testing surge protected equipment and older (pre-1996) IT equipment. The Primetest can also change the leakage limit for Class 1 equipment from 0.75mA for handheld/ portable appliances to 3.5mA for other equipment types, but all the other test options are fixed on the Seaward instrument. 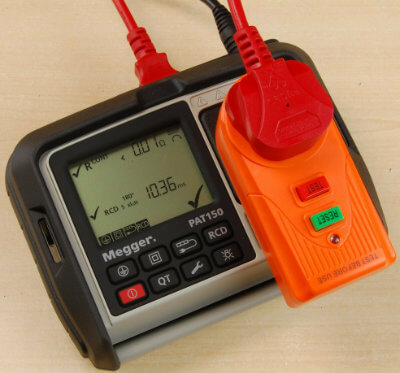 The Megger PAT150 allows full control over the test settings. The pass limits for the earth, insulation, and leakage test can all be adjusted as well as the test duration. This type of control over the test options is only usually found on more expensive downloadable PAT testers. The PAT150 also has a useful single test function, to allow a single test to be performed on it’s own, rather than the usual sequence of tests for Class1, Class2, etc. The Megger also has a couple of additional test functions. One of these is a point to point continuity test. This allows a measurement of the earth continuity of fixed equipment to be made. Another unique test is a SELV (Separated Extra Low Voltage) measurement. Both test instruments have a trip time test for portable RCDs, but again there are some significant differences between the two instruments. 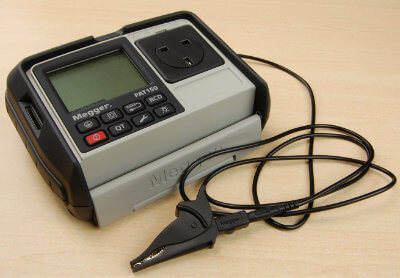 The Megger PAT150 can test PRCDs without tripping the main RCD within the distribution board. To test a PRCD with the Primetest 250 without tripping the main RCD you either need to use an isolation transformer, or find a circuit that isn’t protected by an RCD. Easier said than done, especially when carrying out the testing on a customer site. One consolation is that you can also use the Primetest 250 for testing RCDs within the fixed installation. One feature that I’m always surprised that all PAT testers don’t include as standard, is an option to null the resistance of the test leads. When measuring such low values of resistance for the earth continuity test, the resistance of the test leads themselves can influence the test measurement. The PAT150 has the option to null the resistance of both the test lead and IEC lead. Unfortunately, the Primetest 250 does not have the ability to null the test leads. Both testers run on standard AA batteries. 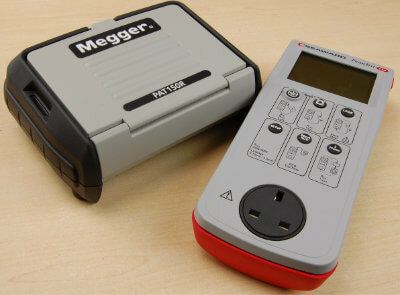 The Megger PAT150 is also available as a rechargeable version, the PAT150R. 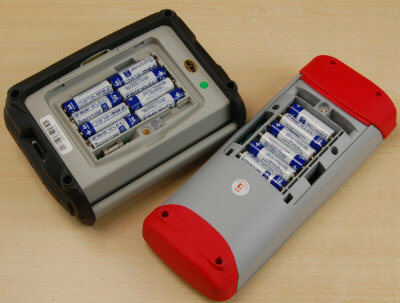 To compare the battery life I fitted them both with identical cheap AA batteries and started to simultaneously carry out a variety of standard PAT tests with both instruments. After 500 tests, I gave up. The battery indicator on the PAT150 hadn’t budged and was still showing full power. The Primetest 250 doesn’t have a battery life indicator, only a low battery warning, however from past experience I know that the battery life on the Primetest instruments is excellent. Megger say that battery life is typically 4 days based on 120 assets per day. Seaward’s guidance on battery life is 2,000 tests using Duracell Alkaline batteries. 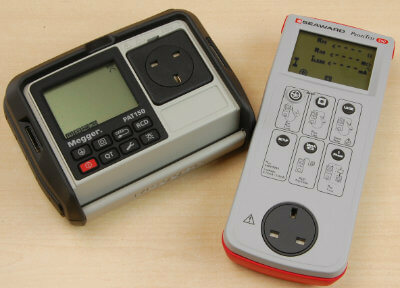 The Seaward Primetest 250 is a very good PAT tester and we have been using it on our PAT courses for a number of years. It’s straight forward to use and we have found it to have an excellent reliability. It’s also the cheapest of the two testers, so if your working to a tight budget, the Primetest is a good option. However when you take into account all the extra features, particularly the no trip PRCD test, fixed equipment continuity test, and ability to null the test leads, the Megger PAT150 is in my opinion the better of the two testers and worth the extra £50.